Via the website I have received a number of emails about whether readers should get their bunnies neutered and what they should expect if they decide to go ahead with the operation. I have decided to collate the main questions and answers onto this page. However if I don't answer a question sufficiently please drop me a mail. This page is no substitute for the advice and care provided by a Vet so PLEASE discuss the operation with your Vet. All I can offer below is the experience I have had with Rodney. More independant advice is available from the Rabbit Welfare Association. At around 6 months of age Rodney was becoming a handful and it all culminated in him starting to spray (marking his territory). I decided to have him done at the vets that I had previously taken him to for his health check and vaccinations soon after I had got him. (I rang round to find the best Rabbit vet in the area before I got Rodney - this involved ringing round the local vets and comparing services, previous experiences and prices). By having him neutered at this age it prevented the behavioural instinct of spraying becoming second nature to him i.e. its better to have them done early! Why is a good Vet important? Finding a good vet is extremely important as not all Vets have experience of Rabbits. 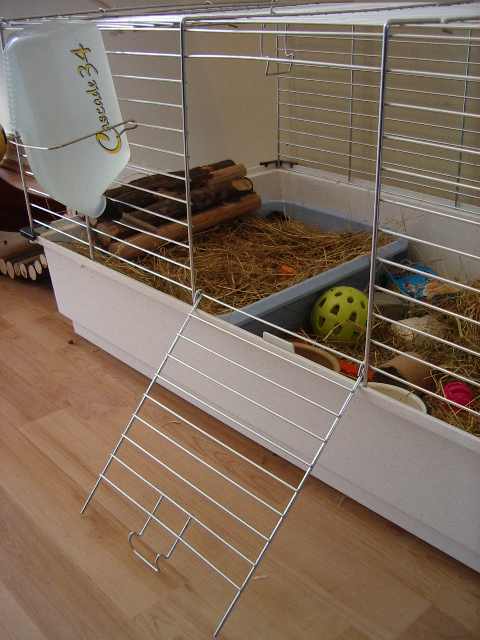 Rabbits are considered an “Exotic” and therefore some vets do not specialise in this area. If you do not know of a good vet in your area ring your local animal sanctuary, or if you are a member of the Rabbit Welfare Association they should be able to advise you of a good vet. Rabbits have been very sensitive to anaesthetic in the past. Now that there are more studies on Rabbits and their healthcare is improving Vets are able to apply anaesthetics to Rabbits with a greater success rate. This is why it is imperative to find a good vet. How long was the operation? Rodney was in over night, he had the op in the morning and returned home that evening. I thought he had an eye infection but it was a very slight reaction to the oil they put in the Bunnies eyes whilst under anaesthetic to stop them drying out. How was Rodney after the operation? I kept Rodney in his cage for all of 2 hours before he was desperate to come out. 2 days later the vet checked his stitches and that was that - all done. The operation is different for females as it involves some muscle tissue so it may take longer for the Bunny to back up to match fitness! However I saw my friends two little twin girl lionheads after they had come out of their op the day before and they were (contrary to vet advice) bouncing everywhere, and there have been no repercussions. Rodney's temperament didn't change after the op, he was just as lovely and cuddly as before. There are so many benefits to having them neutered, don't feel guilty about putting them through an op. Its very quickly forgotton and you will feel better knowing that they won't be subject to infections later in life. (1) Male rabbits can become aggressive once their hormones have really taken hold - this will happen if he is not neutered. (2) If you ever want to bond your bunny with another bunny you will have to have them done regardless of whether the other bunny is male or female. not find them such a nice houserabbit to have around! All I can tell you is that every book I've read, and all the advice I have seen on the newsgroups, points to calmer behaviour in Male and Female rabbits after they have been neutered. Rodney was quite affectionate before his op anyway, but I would say that if you spoke to the Vet the first thing they would ask is whether they have been snipped. I cannot guarantee that this will solve the issue - but it is a start, and its something you would have to do anyway before contemplating introducing a second bunny. Female Bunnies tend to be very territorial and do suffer from phantom pregnancies. Neutering can help alleviate some of these behavourial issues. (1) A female spaying involves some disturbance to more muscle tissue than in a neutering in males so if you have a female bunny and they are quiet and aren’t as active for a day or so this will be why. (2) After the op the important thing is that they continue to eat and drink. If they haven’t eaten or drunk anything by the following morning ring the vet. As soon as Rodney got back in his cage he started munching on Hay so I knew straight away he was fine. (3) If you have used wooden shavings in the cage replace them with a large towel. The shavings can get stuck in the stitches etc. I got an old large beach towel and laid it all over the bottom of Rodney's cage. (4) When you go to pick your bunny up look at their eyes. It was only when I got Rodney home that I noticed his eyes were inflamed. I went back to the vet and basically when they put a bunny under they sometimes put some oil/lubricant on the eyes to stop them drying out whilst under the anaesthetic. Sometimes there can be a reaction to the oil - nothing drastic (Rodney's went really quickly without treatment) I was just a bit miffed they didn't spot his eye lids were red. (5) Make an appointment for 48 hours later when the vet can check the stitches. Make sure you are happy to take your bunny home and that the vet points out anything else you need to look out for. (6) Do not leave the vets if your bunny is asleep or dopey. Ensure that you are happy you know what to expect and look for over the next 24 hours after the operation and that you have any emergency telephone numbers necessary to contact the Vet. (7) Try to ration their food out on the night they come out so you know whether they’ve eaten overnight. Are there any treats you can lay on for their special night back home?